48 hours home and I hope all have caught up on their sleep. Our night in the Miami airport was an exciting end to our exciting trip!! My students/your children did a wonderful job of meeting the challenges of travel and work in another country. They persevered through steep hikes, long hikes, language barriers, monsoon rains, high altitudes, and winding roads. They definitely made Bayside proud! In their final discussion with Vanessa, our Program Coordinator, I was thrilled to hear our students make comments such as "I saw/learned that our countries are more similar than they are different", "when my broken Spanish was not enough, I used charades to communicate", and "I will be more grateful for what I have at home". Great takeaways from any experience!! 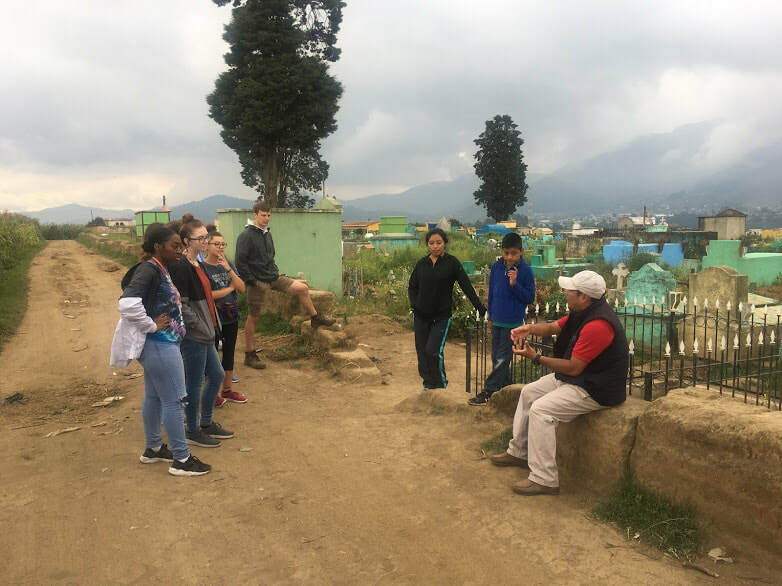 Thank you for trusting your children with me - I enjoyed my time in Guatemala with them and look forward to watching them continue to grow academically, socially and emotionally over the next two years. Enjoy the remainder of your summer holiday - see you in 3+ weeks! Great stats from the four clinic days. The Hill to our homes. Our bus stop across the street/at the bottom of The Hill. It is sadly coming to an end and I absolutely don't want to leave. This experience is one that I can never replace. The culture here is amazing and so family-oriented. Every where you walk people greet you with hola or buenos dias, whereas back home it's very different. Yesterday was by far the most memorable for me because we went to a school and presented posters to help teach good hygiene and healthy eating habits. The children were so bright and full of energy. Many would run up to you and jump into your arms. Today we worked in a new clinic and things went pretty smoothly with my group getting about 12 clients and the other group a little more. Everyone one was definitely on their "A" game. 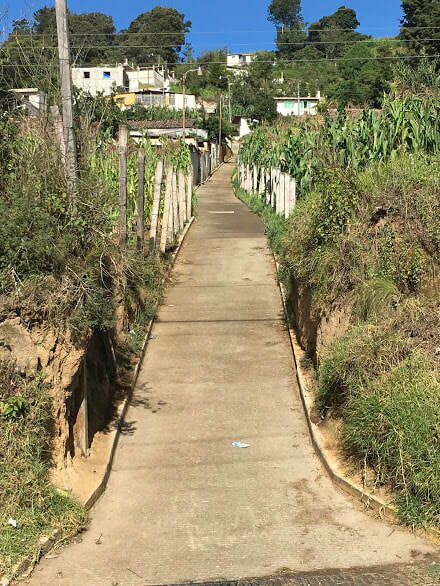 After that, there was the hill that I always dread walking up everyday in order to get to the house. After lunch, we went to the school for our daily two hour Spanish lesson. Right after, we had our tech session on maternal health lead by Carl. We had a discussion on the lack of contraceptives used within the Guatemalan community. Several reasons why women didn't use contraceptives were because of the fear of side effects, husbands wouldn't allow it, and for religious reasons. 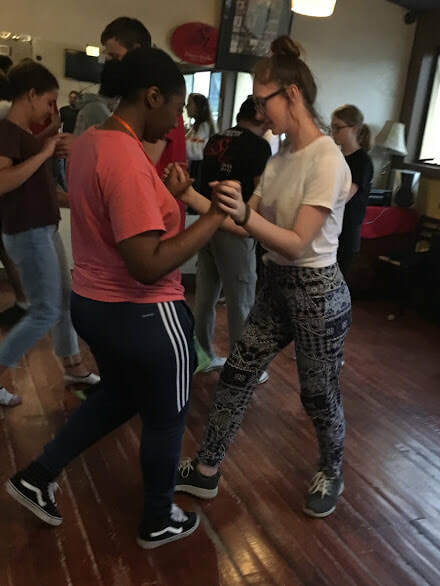 The coolest part of the day was the salsa dance class we had after the tech session. At first, I didn't really quite get it but after a few practices I finally got the hang of it. The instructor taught us two compos and we worked with a partner and practiced them. We switched partners after every song. In my house, we had beans, eggs, and fried plantains for dinner - the plantains were amazing! We ended our meal with cake, which we bought in order to celebrate with our host family. For the past few days, we have been preparing presentations to present to an elementary school, and this morning, we finally presented them. We were split into three groups: nutrition, hand-washing, and oral health (my group). 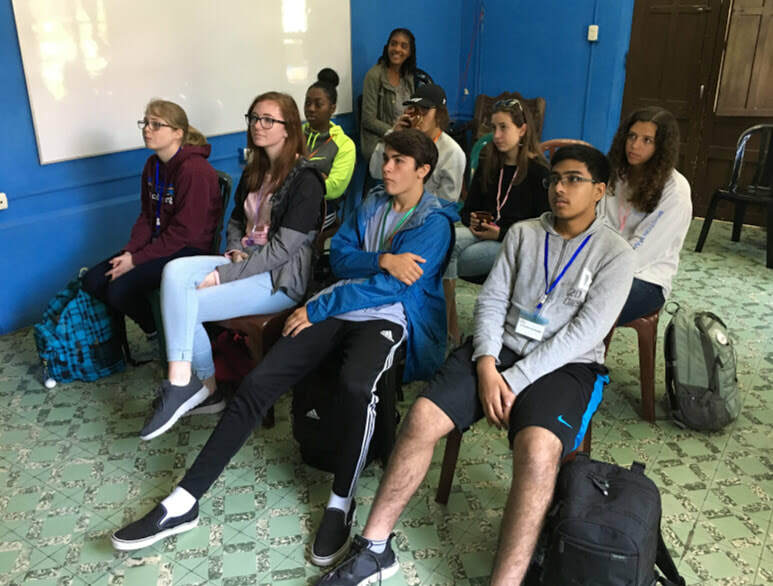 The kids were very young, energetic, and wild, but were mostly quiet during our speeches, which probably helped them better understand our broken Spanish. Afterwards, we went outside to do health-related activities and play some games. Overall, we had a lot of fun, and we wish we could have spent more time with the kids. After lunch, we went back to Celas Maya, where we completed our daily Spanish lessons. When we were done, I got a chocolate-covered banana and a hot chocolate from the cafe, which were both very delicious. While I ate my food, we had a tech session in which one of our program coordinators, Nicole, talked about respiratory illnesses. We received an article to read to prepare us for a maternal health talk we're having tomorrow afternoon. The final thing we did was make posters for a health fair we are volunteering at tomorrow morning. Other than that, we have been hanging out in our homes and spending time with our host families. The only thing I have a problem with here is that it gets dark really early, at around 5 or 6:00, making it harder for me to see where I'm going when I walk the path to get home. That, and the fact that the hill we live on is so steep that it may be the death of me. As Sundays are typically spent, we treated today as a day to relax. Usually our days are spent on a time crunch with multiple activities in store. However, today started off with us being able to sleep in with breakfast being at 8:30. From there we stayed back at our host families house. I spent the majority of my time there playing with my host families kid, Camillio. At around 11 my group and I decided to walk to the markets in Cantel. Walking around in the markets, a young boy ran up to me and grabbed my hand. I didn't recognize him at first, but to my surprise it ended up being Camillio. 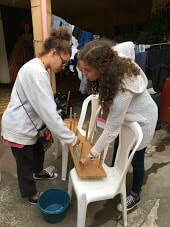 After the market we walked back to our temporary homes for lunch and to also work on our lesson plans, which we will present to a school on Monday. After working on the lesson for a little, we went on a tour provided by Jamie, the son of Donna Maria, one of the groups host mom. On the tour, we went to the top of the hill, which our houses are on. We went through the corn fields, graveyard, and also passed a soccer field where two local teams where playing. A little over halfway into the tour it started to pour rain on us. We had to take shelter for a little under the roof outside of a small shop. 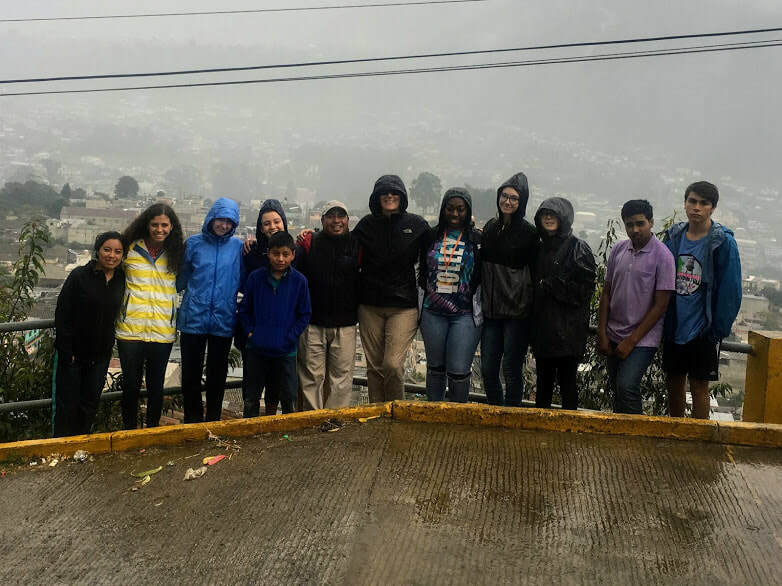 As they rain died down we went back to our houses to dry off, which is where we are now finishing up our lesson plans, drinking hot chocolate supplied by the host family, and waiting for dinner to be made. Today has been one of my favorite days so far. We started the day with another amazing breakfast, and then got ready to go to Lake Atitlan, which was about a 2 hour drive. 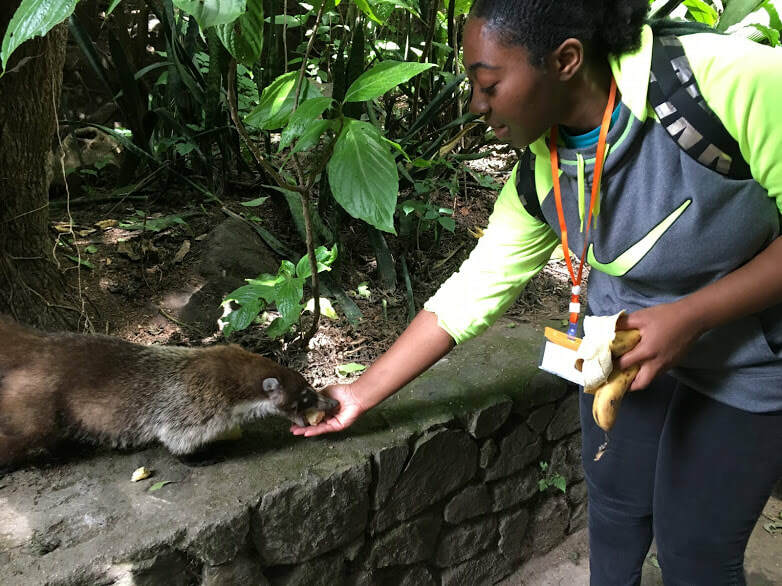 When arrived, we visited a beautiful park where we hiked many miles over rocks and scary bridges, and fed bananas to some mysterious animals and monkeys. There was an area of butterflies, and a beautiful place at the lake where we could sit. After we finished our hike at the park, we then went on a boat ride to lunch. It was an amazing meal, with kebabs and salads. There was also cake at the end, which was a definitely a plus. We took a tour of the building, which also happens to be basically a trade school for art, carpentry, and culinary practices. I will not forget to mention the walk it took to get to the cafe, though. After hiking in the park, the 1 mile uphill walk was not the easiest, yet it was well worth the journey. After our lunch, we walked back down to the dock to catch our boat, and luckily the way back was much easier than the way up. We rode the boat back to the main island, where we then walked around the markets for an hour or so. There were so many amazing pieces of art, clothing, accessories, etc., and I know some of us spent a little too much money (including me)! In conclusion, today was an amazing day full of fun journeys (and exercise), and we all learned a lot. I have not yet been disappointed by this beautiful country, and I am very excited to see what the rest of this trip has in store for us. 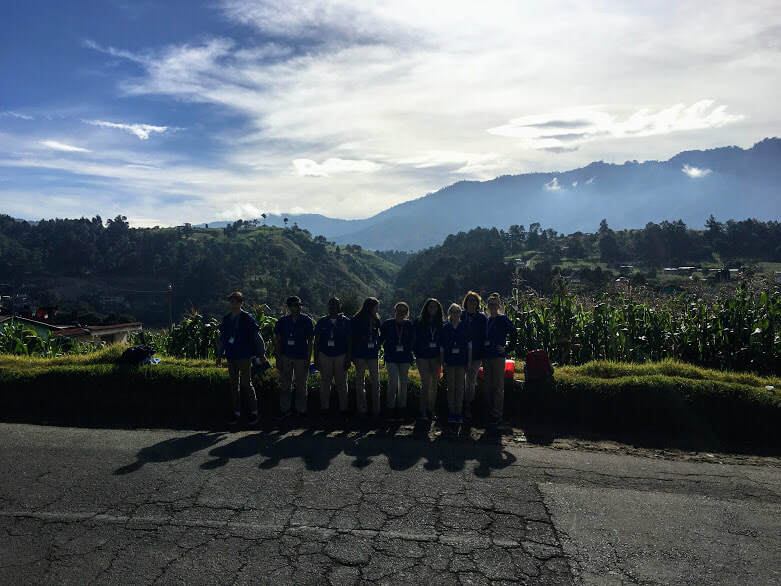 ~Alex D.
,After having spent only 3 (long) days in Guatemala it already feels like home. Honestly, typing this in English is difficult considering the amount of Spanish we have all been using in our time here. People always say that you learn a language much quicker when you are immersed in it; however, I never knew I would learn so much so quickly. Today we had yet another AMAZING breakfast after waking up late. We are still adapting to the dogs, chickens, birds, people, and other various noises that intrude our room at night. 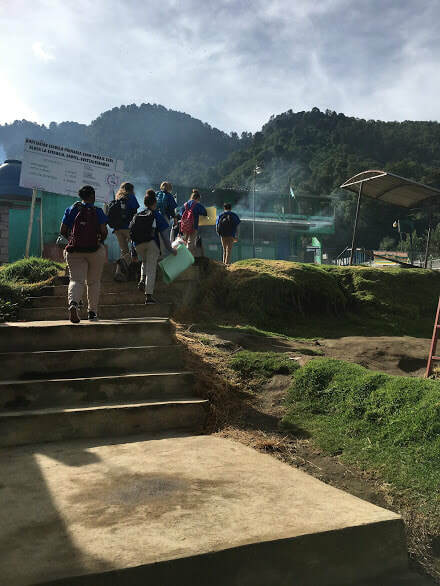 When arriving at our second pueblo I was unsure of how many patients we would have considering we got dropped off LITERALLY in the middle of a corn field. However, by the end of our two hour shift we had seen around 20 different people- mostly women. Although, we had to adapt, for the pueblo was a little small and we ended up moving/switching table positions three times before settling down. As Nicole (a Duke student helping us) says, you gotta adapt. The highlight of the pueblo was definitely the babies, toddlers, and infants we got to see! Mrs. Loflin LOVED getting to hold the children and play with them all as did all of us. It was so much fun that the two hours went by in what felt like 10 minutes. After the pueblo we returned home for lunch then grabbed coffee at a local cafe before Spanish lessons. Spanish lessons might be my favorite part so far because my teacher is so kind and friendly and makes learning the language so much easier! After Spanish we went to Trama Textiles. 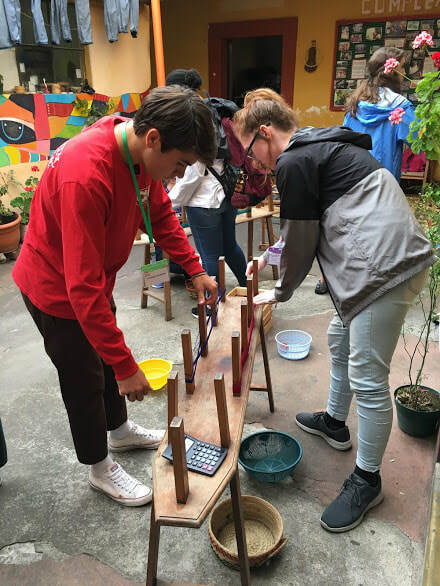 Trama Textiles is a weaving school and business whose profits all go to the women who make the products- especially those affected by the Guatemalan Civil War as well as those struggling to provide for their children/families. It was an amazing experience. Now, Emily, Shaylyn, Alex, Mrs.Loflin, and I are playing uno, chatting, watching futbol and hanging out with the kids of the house. They are both younger and FULL of energy! I love my homestay family and never want to leave them. We are all very tired but very excited for tomorrow! 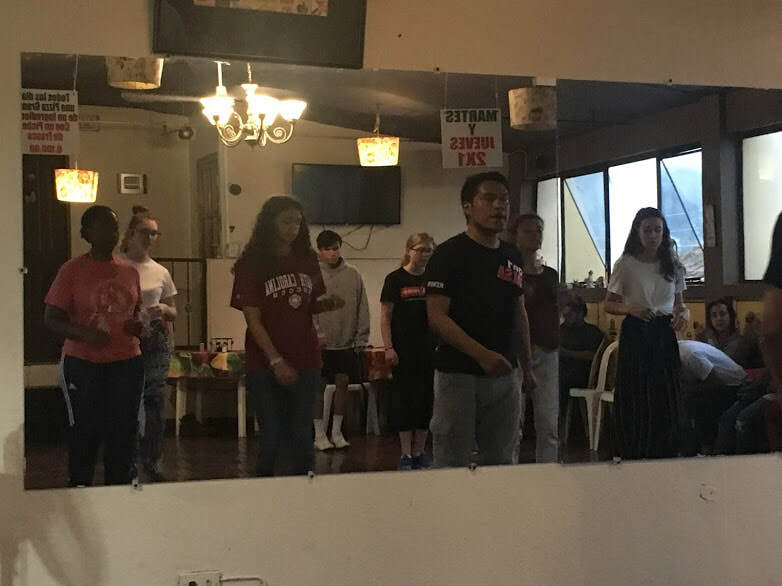 ​Peace and Love, Sara Rose H.
This morning after breakfast, we went to our first Puesto de Salud where we took height, weight, blood pressure, and blood sugar. After the Puesto, we went back to our houses where we had a delicious lunch and took a quick power nap before heading to Celas Mayas. At Celas Mayas we had our first 2 hour Spanish lesson which was a lot easier than I thought it would be, and the teacher was nice which was a bonus. Once our Spanish lessons were over we had a tech session on culture and then started on our presentations for the school. We left Celas Mayas after working on the presentations and headed back to our houses for dinner. The host family is super nice and the kids are adorable. Today was very fun and I am excited to see what else we will be doing this week. This morning we woke up to some delicious pancakes (provided by our host family) and a beautiful view atop of the mountain side. Then we drove to Celas Myas to learn about Public Health and Nutrition. 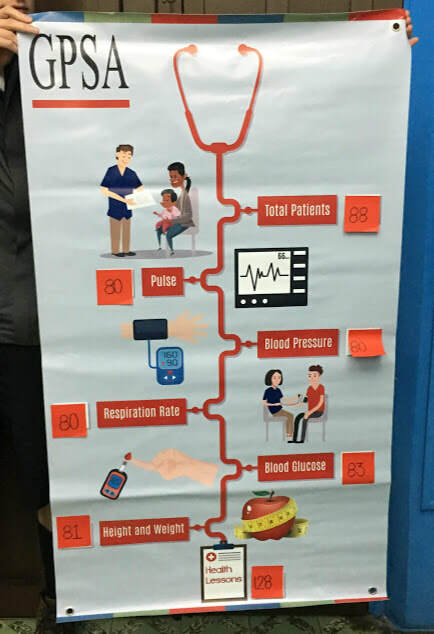 We also reviewed Spanish phrases to use when we are asking to take blood pressure, pulse rate, respiration rate, and blood sugar. We ate Quaqik for lunch which was amazing. Thereafter we went for a scavenger hunt and looked around in the marketplace, at the wide variety of items in the shops. Safely on the ground in Xela! After a bit of a delay in the Miami airport, we made it to Guatemala City around 5:30 p.m. (local time) yesterday. 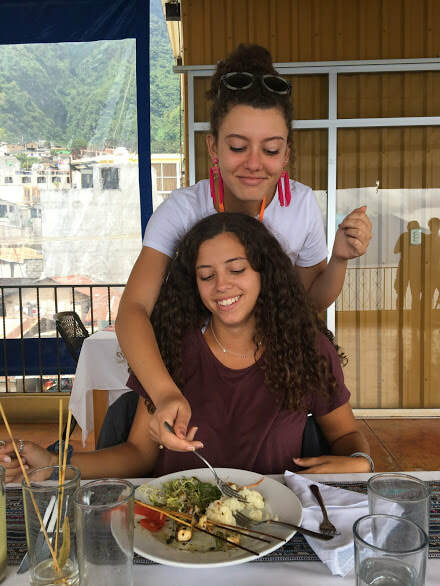 We had a winding drive through the mountains and enjoyed a delicious meal before arriving at our homes at 11 p.m. All slept well and we are currently at Celas Maya in Xela for our Orientation. Stay tuned, students will begin blogging tonight!! We slowly made it through customs! 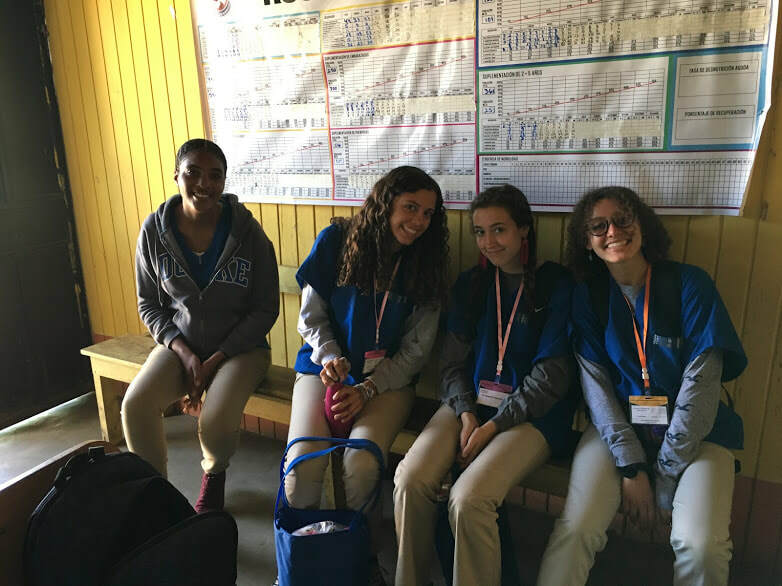 GPSA for Health is a hands-on, academic, service-learning program for high school students, and works in educational collaboration with Duke University and Johns Hopkins University. 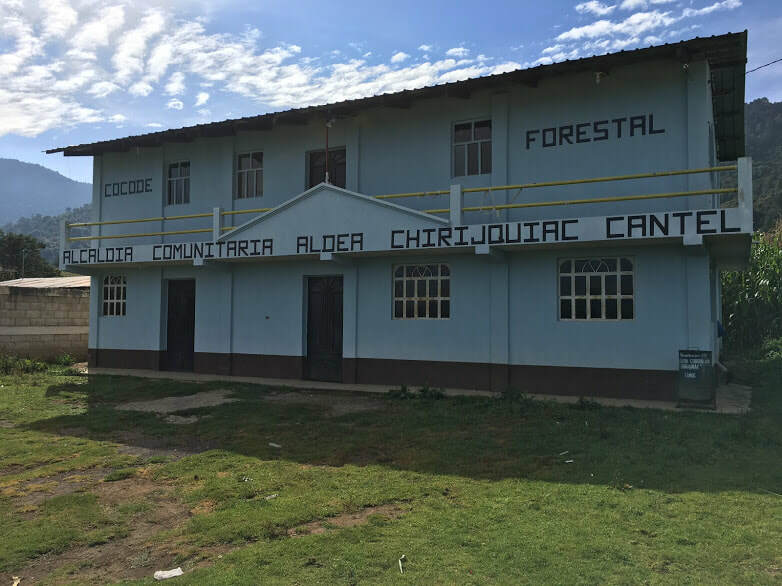 We will be providing hands-on help, and tackling real-world problems with the environment and healthcare in Cantel and Zunil, Guatemala.